LG plans US Google TV launch for May 21 | What Hi-Fi? LG is expected to release an internet-enabled Google TV on May 21st. The smart panel is aiming to compete with the upcoming Apple iTV. 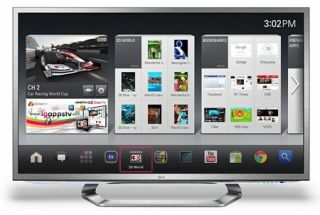 LG’s Google TV is reported to be launching on May 21st by Reuters, which claims to have got the dates from an LG executive. While Google can expand its advertising to your living room, LG should be able to continue shifting TVs at a rate that can compete with Samsung and, soon, Apple. What does that mean for us? Google searches and YouTube accessible from your armchair with, hopefully, a fast and stable browser. Further details can be found in our CES 2012 show report. Sadly, the LG Google TVs will initially launch in the US only. If it is successful, Europe and Asia will also get their hands on LG Google TV soon, probably just in time to beat the Apple TV launch we’d wager. And don't expect Samsung to be far behind – it too plans to launch Google TVs.